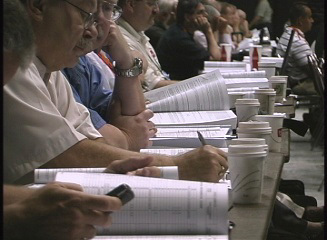 The ICC presents hearings for the public considering new building code proposals. Meetings are scheduled semi-annually. Each hearing attracts upwards of 3000 participants including building inspectors, architects, fire marshals and others interested in promoting safe building construction. This website is not presented by ICC. 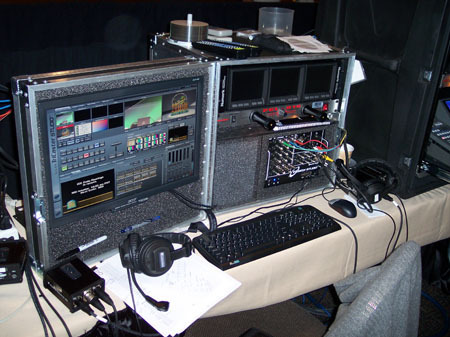 It was built by Jim Powell, CEV* and is solely for the purpose as a case study in video presentation and web-cast training. All comments are by Jim Powell, an independent contractor, who works on the production team for the ICC Electronics Media Department. The following is specifically for training purposes only and is presented with permission. All photos are Copyrighted by the ICC. Any reproduction is strictly prohibited. 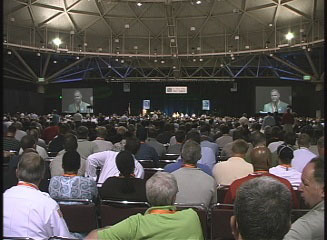 As many as 3,000 participants attend each event. 2 ball rooms are used to accommodate the participants. are used at each hearing in each room. 2 complete video systems are used, one per room. sometimes each day from 8 am to midnight. recorded to hard-drives and DVD discs, and web-cast. 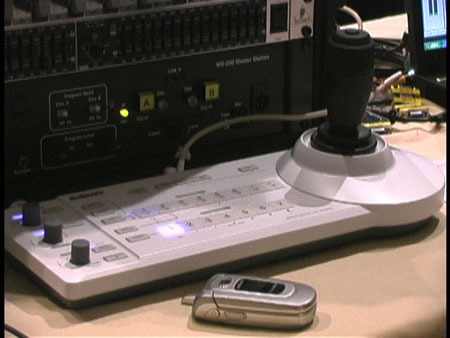 The BRC 300s are moved by this controller. ICC uses at least 6 presets for each camera. in each room with pan, tilt and zoom features. Up to 7 cameras can be controlled by one unit. proponents, staff and the moderator. in one dedicated laptop via high speed Internet connection. before DA. encoding for the Internet, and many additional features. 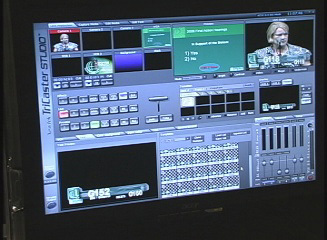 The above is a brief photo introduction into the ICC Hearings video system for live presentation, recording and web-casting. Note: Jim, a CERTIFIED VIDEO ENGINEER, works with the ICC Electronics Media Department as an independent for technical support and as an operator. He has experience working with each of the above components with extensive work with the TriCaster units, remote camera operation and Canon XL H1 operation. The above system was designed by Manager Rick Carroll and his staff at ICC. Jim has spent more than 35 years in the communications business gaining experience in radio, broadcast television and corporate television including work as a producer, engineer, videographer, on-air talent, and programmer. He is a member of SBE (Society of Broadcast Engineers) and a Certified Video Engineer, Life Member of The Media Communications Association-International (MCA-I) and a member of AAF (American Advertising Federation). Jim is also a licensed FCC 1st Class Radiotelephone with Radar (Broadcast Engineer). Today, he is an independent providing production and technical support. He also lectures and teaches fundamentals of electronic presentation and related technology. The above is a case study used in those presentations. 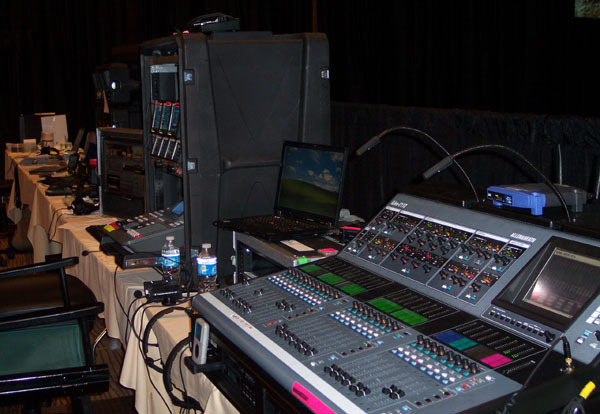 He has also taught and shared production and communications business knowledge in lectures and seminars at the MCA-I International Conference, InfoCOMM and many MCA-I Chapters.